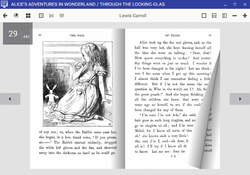 AlfaReader is a lightweight and fast ebook reader. AlfaReader 3.4 was available as a giveaway on November 14, 2018! Ideal for reading fiction books, magazines, student textbooks, medical, scientific, technical books, illustrated books for kids. 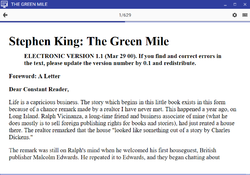 AlfaReader allows to read PDF, EPUB, MOBI, FB2, CBZ, DJVU and TXT books and magazines. 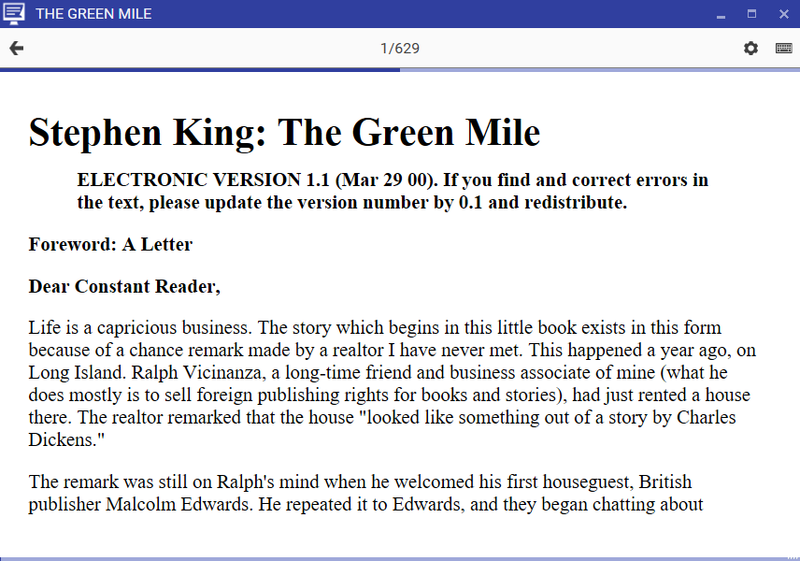 You can select between the multiple e-reading templates and zoom pages and font size. 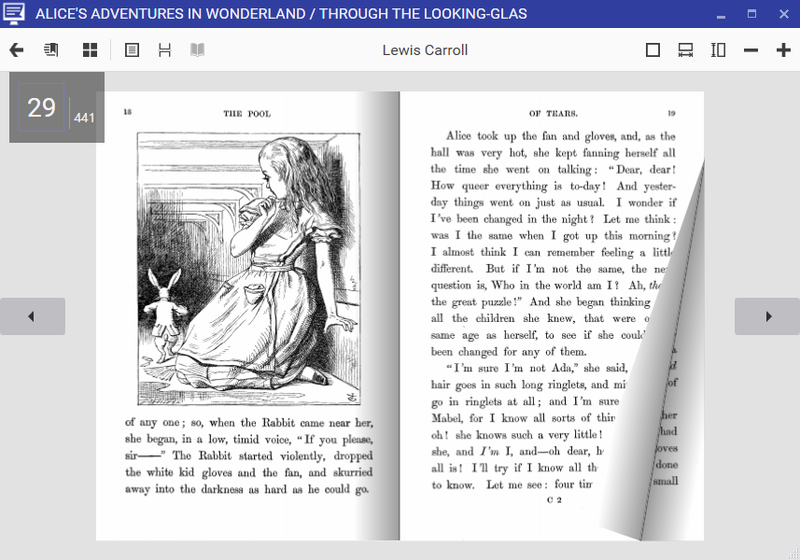 The program automatically saves bookmark, window size and reading template for every book. How would you improve AlfaReader 3.4? The most powerful and easy-to-use Book Organizer. Alfa Ebooks Manager is a program that allows to organize your electronic and paper books in a single e-Library. This program has an error. On some pages of my epub file I noticed that the text runs across the picture. If it's a dark picture then black text is difficult to read. I tried the same epub file on the icecream ebook reader and did not have this problem. Text was at 100% size in both tests (not enlarged). This program has an error. On some pages of my epub file I noticed that the text runs across the picture. If it's a dark picture then black text is difficult to read. I tried the same epub file on the icecream ebook reader and did not have this problem. Text was at 100% size in both tests (not enlarged). I found the text size too small to read, then when I increased the text size to a suitable reading size some of the text disappeared off the page. There doesn't seem to be any way to scroll down the page when the text size has been increased in order read the rest of the text. It looks like the text that does not appear is on the second page when enlarging text using this problem. But text running across photos ruins this program. Brian, It looks like the text that does not appear is on the second page when enlarging text using this problem. But text running across photos ruins this program. Use Calibre, it does everything. PDF/Acrobat free version is enough for any. Of files if you want to keep them separate. I use the the freeware "Everything" (aka "search everything") to find any stay file by name and/or format in seconds. Use Calibre, it does everything. PDF/Acrobat free version is enough for any. Of files if you want to keep them separate. I use the the freeware "Everything" (aka "search everything") to find any stay file by name and/or format in seconds. Although I don't currently read e-books, I'm wondering - do we need a "reader" app? Can't Windows open the file or book so we can view it? Icecream - free vanilla or pro chocolate? Zen , Icecream - free vanilla or pro chocolate? That's another thing that needs to be added to the Microsoft Operating system. I wonder if Apple has it for their computers. Zen , That's another thing that needs to be added to the Microsoft Operating system. I wonder if Apple has it for their computers. I've been using the free SumatraPdf for years so this seemed like a good one to try as well. Install on Win 10 64bit went ok. It does not create a second copy of the book. I can drag and drop a new book or add it through the menu which is the second icon on the upper left, the add button should be on the drag and drop page. To delete you drag it to the top and a trash can shows up, a delete button should also be on the list of book page or visible. The render looks nice like a book, was quick and easy to read. Ctrl-O or the gear icon in the upper right lets you adjust to one or two page, size and type of font and can make it centered or add space between lines for example. I am wondering if its possible to add zoom like zinio has for magazines. I am having issue with returning to the page it was on. When the table of contents were showing, sometimes it saved the page I was on or went back to the page before instead. When the table of contents were off, it saved the chapter it was on however it did not save the exact page within the chapter and instead returned to the beginning of the chapter. Since it was 4.95 instead of 9.95 when adding to the cart I decided to buy it and hope its further developed with feedback. 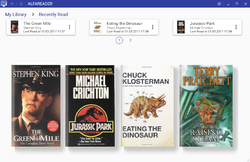 The ebook manager pro which is another program they have looks useful since it edits metadata or covers and manages books but there is also the free calibre of course if you are just using for edits and not managing book library to consider as well. You use the right or left arrow keys in books like epub to change pages, I suggest adding a click on the page as well to allow page change. PDFs work better, they had zoom feature, fit to width or height of page, and there are arrows for clicking to change page or use arrow keys. Pdfs did not have problem with returning to the exact page. The ebook side like epub is where I'm finding the minor issues. There is also no multiple bookmarks feature just goes back to the one page you were on when closed and that didnt work properly for epub exactly as mentioned but ok for pdf. No zoom in ebook although you can change font size and type for similar effect. I know XP is obsolete, and is not included - but will AlphaReader work on an XP-PRO SP3 machine? Anyone tried it on XP? Hello, I know XP is obsolete, and is not included - but will AlphaReader work on an XP-PRO SP3 machine? Anyone tried it on XP? Eldad, they require NetFW 4.5. Eldad, Icecream ebook reader works excellently on XP. I use it all the time, got it from GAOTD some time back. 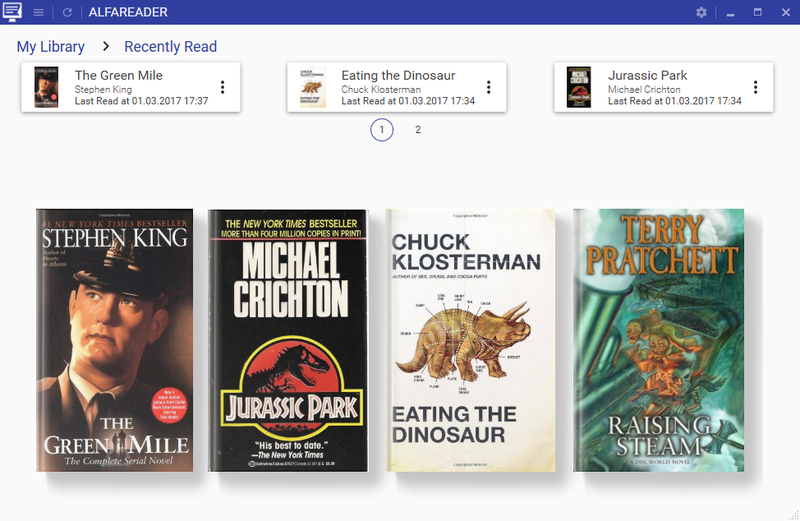 It seems they have that scan feature to add existing folders or scan for updates in the separate ebook manager program basic version, with the pro version further adding metadata edit, book converter, and ability to copy books (file manager). No auto turning by clicking on a page (that I could find, and no User Guide nor Info available). No clear intuitive way to bookmark a page (that I could find, and no User Guide nor Info available). upon clicking one random Mobi book, it opened as a ...MS Word 2000 ?????? ! @#$ !!! I went back to Calibre, and it opened that book without any hassles. Guess what : It plasters itself all over your registry, sharing their registry entries with other software, so beware if using a thorough Uninstaller like Revo - I did the normal uninstall, and lo and behold, my icons still show the AlfaReader icon, though the software was uninstalled. I had to revisit the Preferences page in Calibre to fix it. I just installed it on my very fast PC (up to now, on main PC, had been content with Calibre, but thought I'd give this a test run). Here's my true findings, after setting all Mobi , AZW & Epubs as default on it) : TL;DR : AVOID ! Reasons (amongst others) : No auto turning by clicking on a page (that I could find, and no User Guide nor Info available). No clear intuitive way to bookmark a page (that I could find, and no User Guide nor Info available). I could go on, but I'll just end of with this : I went to my physical eBooks folder, and sure enough, my regular Mobi files showed the AlfaReader icon, however.... upon clicking one random Mobi book, it opened as a ...MS Word 2000 ?????? ! @#$ !!! I went back to Calibre, and it opened that book without any hassles. Therefore : Immediate uninstall. Guess what : It plasters itself all over your registry, sharing their registry entries with other software, so beware if using a thorough Uninstaller like Revo - I did the normal uninstall, and lo and behold, my icons still show the AlfaReader icon, though the software was uninstalled. I had to revisit the Preferences page in Calibre to fix it. Installed without a hitch and pleasantly swift in my Win 8.1. Without inferring anything negative at all, I have to say it's been suspiciously easy and fast lol. Now, I'll see how it lives up to developers' claims. I have to agree with comment #1 re: the misleading claim of the Alfa Ebooks Manager being free when, in fact, it appears to be a trial version. The price is not the issue; it's the principle - why resort to erroneous advertising statements? Especially with it being so obvious. However, I thank GAOTD and Alfa.NetSoft for this opportunity. Installed without a hitch and pleasantly swift in my Win 8.1. Without inferring anything negative at all, I have to say it's been suspiciously easy and fast lol. Now, I'll see how it lives up to developers' claims. I have to agree with comment #1 re: the misleading claim of the Alfa Ebooks Manager being free when, in fact, it appears to be a trial version. The price is not the issue; it's the principle - why resort to erroneous advertising statements? Especially with it being so obvious. However, I thank GAOTD and Alfa.NetSoft for this opportunity. peaceworks, re Now, I'll see how it lives up to developers' claims. That's swell. It really means a lot to learn of your future intentions. peaceworks, re Now, I'll see how it lives up to developers' claims. That's swell. It really means a lot to learn of your future intentions. The one question these programs don't answer is this: When ebooks are added, does it create a second copy, or does the program just point to or interact with the original. I have 1000's of ebooks, and I do not want to create second copies. I do not want to import in the program and delete the originals. Too much danger of losing ebooks if the program fails. So does this program create a second copy when an ebook is added to it? It did not create a second copy when I added them, and it did not erase them from the hard drive when I deleted them from the list by dragging it to the top of the screen so it doesnt interfere with your collection nor duplicate it. What isnt explained well is that there is also a more featured version of the software ebooks manager. 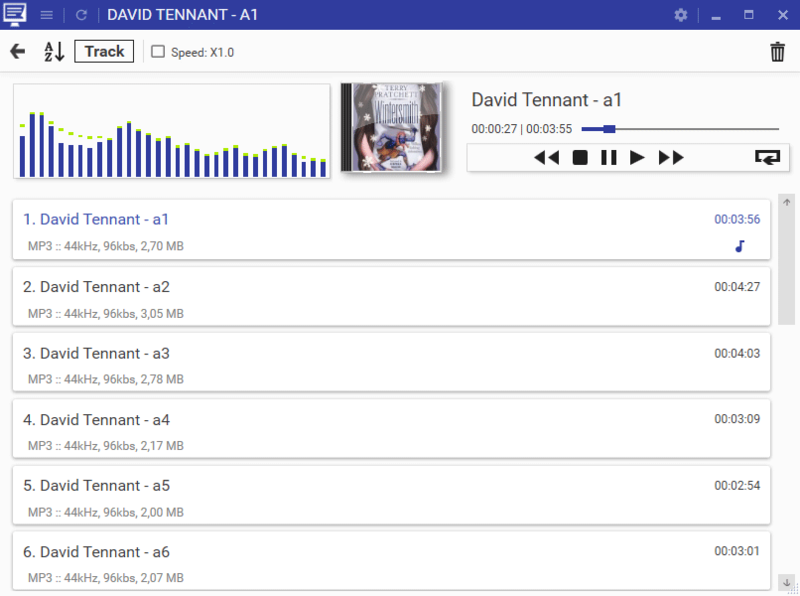 This has the same reader but also adds audio book support and the ability to scan drives for books or update from them for those with large collections, manage a large collection, and a few others, and a pro version that further adds metadata editing, book conversion, web download etc. The alfareader doesnt load all the book collection if you just want to read something quickly. The license seems to be lifetime but will not have upgrades and they may be wanted as this version has some minor flaws, so I guess you have a choice of free version without upgrades, 4.95 for the upgrades, 9.95 for basic ebook reader or 19.95 for the pro ebook reader for this offer. Or say the basic ebook reader plus the alfareader for 4.95 so you can load books fast without opening the entire collection each time. I wish that was all explained like that with these offers lol. Downloaded and installed with no problem (Win10 64). When I accessed Project Gutenburg the only selections available to me were in French. Is there any way to default to English? I live in Quebec, but I am English speaking. TeeGee, You can get books to download from Feedbooks in either epub or PDF. Those in the public domain section are free and most of the books are in English. Some are from Gutenburg and alfareader should read them. TeeGee, Maybe this is the wake-up call for you to start learning French. How can you exist in Quebec without knowing that lingo? Frank, thanks for your observation. The community I'm living in is 60% English first language. I like living here but unfortunately don't have a flair for learning a foreign tongue. Be honest - how many languages do you speak? Frank, thanks for your observation. The community I'm living in is 60% English first language. I like living here but unfortunately don't have a flair for learning a foreign tongue. Be honest - how many languages do you speak? Easy to install on Windows 10 x64, works well, I was able to easily add files by dragging and dropping them on the window, I was able to use the library feature to download epub files from Project Gutenberg, *a free ebook site*, which I was able to get from the built-in OPDS client that allows you to easily add books from public OPDS Catalogs to your library and download electronic books freely. The current offer on the website is 50% off, for a total of $4.95 USD. NB: The program is preactivated. No activation key is required. 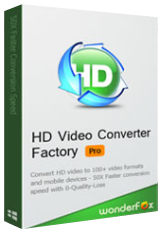 You have to install it before the Giveaway offer for the software is over. The download was problem-free. I've just checked it out as a pdf reader, and I'm impressed by the speed of its rendering of complex pdfs - very significantly faster than Adobe, Foxit, Sumatra, etc. No more thumb-twiddling looking at "Rendering - Please Wait" while it tries to display an end-paper! Hi David J Wilson . . . I've never encountered a delay waiting for rendering using Sumatra. I have used Calibre for many years now but it can be slow sometimes, so I will give this one a try today. It is sad that the Ebooks Manager is not offered FREE with this version of Alfa Reader, and note, it is NOT free as they suggest above, but rather a full featured trial version. Wish these software companies wouldn't resort to BS to get people interested in their software. Hughjocapivvy, Really helps a lot to learn that you are planning to give this a try today.